New Zealand's leading building and house wash exterior cleaning company. 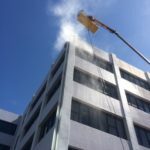 Chemwash Cleaning was formed in 1981, with the goal to utilise low-pressure, environmentally-friendly detergents in their exterior cleaning services. Our unique detergents were developed by a leading industrial chemist to be effective and safe for use in the environment, as well as around housing, pets and people. Chemwash continues to grow and develop, improving our detergents and processes as we go. There are now over thirty franchises in most regions of New Zealand, headed by our professional national manager. Each Chemwash branch is operated with qualified, licensed agents, who have passed a series of stringent conditions and checks, including police background checks. Chemwash is fully insured and we offer the most up-to-date cleaning practices in the industry. All Chemwash staff undergo ongoing training in maintaining a safe and healthy workplace for customers. Many are ITO certified in height and fall arrest systems. We ensure quality service through customised product and equipment application, regular inspections, and our quality guarantee. The Chemwash Low Pressure system is specialised for the cleaning of all exterior surfaces. It involves applying our detergents, and then rinsing off with relatively low water pressure (about 600-1000psi, compared with 2000-5000+psi for a lot of water blasters). Our fan spray nozzles eliminate the possibility of damage to surfaces, and this low-pressure washing also uses a lot less water than high-pressure water blasters. Maintenance programmes may include "Spray and Leave" treatment for roofs, concrete cleaning and house washing for mould & lichen.